Ellis Music Company - Accent on Christmas and Holiday Ensembles for Trumpet or Baritone T.C. 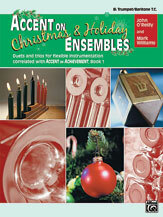 Music and Method Books > Duets and Ensembles > Accent on Christmas and Holiday Ensembles for Trumpet or Baritone T.C. Accent on Christmas and Holiday Ensembles for Trumpet or Baritone T.C. This collection of easy duets and trios is designed for beginning musicians. Contains Christmas and Hanukkah tunes, as well as the popular New Year's theme, Auld Lang Syne.